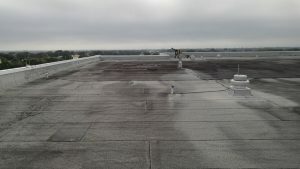 Top 8 Reasons for Commercial Roof Failure - Commercial Roofing | S & S Roofing Inc.
Too often, the only time a roof is mentioned or tended to is when there is an issue, such as a leak or after effects of a storm. There are multiple reasons why a low-slope roof could fail, and fortunately, many of them are common enough that they can be preventable. Let’s take a look at the top eight reasons why a roof would fail, and what could be done to prevent them. From the get-go, if your roof is not installed correctly, the chances of problems arise increases dramatically. If the workmanship of the installation is lacking in any facet, it’s bound to cause problems at some point in the life-span of the roof. Most of the problems found in roofing are attributed to an installation problem. For example, there could be severe issues with the adhesive if there was not appropriate time taken to clean it, allow it to dry, and primed before installation takes place. Though it can be difficult to identify with the naked eye, faulty installation leads to issues down the road and can cause premature aging or premature roof failure. If your roof is applied using a torch mod bit, the quality of the roof will be compromised if the sheets are not relaxed before installation. In this scenario, there can be problems with wrinkles, blisters, contraction of sheets, fish mouths, and more. For these reasons, it’s crucial to do your research on roofing companies and their installation results. Once the roof is installed, if there is construction on the roof or there are installations needed, it’s easy to have a puncture occur by tradesman installing different pieces of equipment. Each piece of equipment added to the roof will increase the chances of punctures and penetrations, causing wear and tear that may be voided out of your warranty. Once your roof is installed, do your best to ensure limited foot traffic and ask for inspection after all installations are finished. An effective way to limit unnecessary foot traffic is to create walkways with extra support installed to reduce wear and tear on the other portions of the roof. In the case of metal roofs, you can run into issues with sealants, which can be extremely compromising to the longevity of your roof. Though there are a variety of low-slope commercial roofing styles, if there is a leak, there’s a problem. The causes for roof leaks can vary and the type of leak is often identified by the type of roof installed. For example, a built-up roof could have issues due to faulty flashing installation. In fact, it’s said that 95 percent of leaks with built-up roofing systems are a result of missed details in flashing installation. For torch applied, modified bitumen roofs, leaks will often occur when there has been a lack of proper moisture barrier installation. The result is that moisture is able to seep under the flashing membrane if the roof is installed where the water can flow against the lap. As a result, leaks and blisters occur and cause structural issues within the roofing system, including roof failure. Even with single-ply roofing systems, leaks can occur if their membranes are not properly seamed. The seams in a single-ply roofing system are the source of their success, if the seams are not properly glued or heat-welded they will not be able to withstand the moisture they hold. This will result leaks over time. 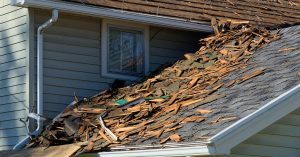 As we stated at the beginning of this post, it’s easy to forget about a roof until an issue sprouts. One of the most common causes of roof failure is the sheer neglect of roof maintenance. Unfortunately, many business and building owners are not educated on roof necessities and suffer more expensive consequences as a result. Knowing the best practices to help keep your roof intact for the long haul can prevent disasters, like punctures or leaks, from happening. Something as simple as a routine inspection will mitigate these issues, and can help identify potential weak areas or threats ahead of time. If identified early enough, these issues can be fixed ahead of time, saving money and any long term damages. At a minimum of once a year, a roof should be inspected and cleared of any debris or trash. In the event of a major storm, it’s also highly recommended to have an inspection performed. Common symptoms of a built-up roofing system include splitting, blistering, surface erosion, and ridging. Each one of these, though common, should never be overlooked. Over a period of time, they all can cause bigger problems. Blistering itself is often not notable to fix, unless you identify one of a larger size, in which case you should have it inspected as soon as possible. Along with blistering there can be an accelerated aging of the roof or even felts that end up slipping. If there is a torch-applied modified bitumens roof installed and the membrane is not put in properly, blisters and slipping will occur. Again, though not initially alarming, if there is a lap area that is affected, it’s likely it will need attention for repair. In the event of a cold-applied mod bit system, the entire membrane application should be all at once. It’s important to schedule this during holidays or work breaks. If the adhesion is not applied properly and blistering results, the risk of delamination becomes a risk and can result in expensive repairs. Water should never be allowed to accumulate on a roof. If you are looking to have a commercial roof installed, it’s necessary to have slope and tapered insulation designed in in order to keep the water from ponding. If these measures are not taken initially, the result is the build in of ponding water. As a gauge, water should not be allowed to sit on a roof for over 48 hours. However, before you call in for repair, the source of the ponding water should be sought out. It is possible the water is coming from a source that needs to be fixed itself, such as an HVAC unit. In the installation of a hot bituminous system, it’s important to note if there is improper mopping, it can block drains or cause voids in the membrane. Without a clear runoff for roof water, ponding results and can put you in a dangerous position of having your warranty voided. While we have unlimited access to countless how-to videos promoting the do-it-yourself mindset, applying this to roof repair is never a wise idea. If you decide to take repairing a roof into your own hands, it’s very possible you will end up making a simple problem a big one. A common repair attempted is with metal roofs. It can be tempting to diagnose the issue and go up with caulking or sealant that is completely wrong for the project as a whole. Though metal roof mishaps are common, they are not the only ones that occur. With a built-up roof system or a modified roof, many issues can be mitigated with a simple bucket of plastic cement. Before you grab it and go though, it’s mandatory to understand the proper amount and approach to these minor fixes, or you run the risk of causing more damage to the roof. Always reference an instruction manual, and when in doubt, call your trusted roofing company for direction. Also a result of improper installation, when flashing is not correctly attached during roof installation also causes blow-offs. Additionally, roofs can have a reduced puncture resistance, a problem that can elevate the severity of what could be a minor issue if properly installed. In the case of a hot bit torch-applied roof installation, billowing and other similar issues are caused by poor ravel embedment or the wrong number of fasteners used when applying the base sheet. In the same breath, when seams are not allowed to seal properly in a cold-applied mod bit system, wind uplift resistance can be heavily decreased. Due to the lack of integrity in the seams before they cure, they run the risk of being thwarted by moisture or be damaged by wind uplift. With single-ply roofing, there are a few extra precautions taken to help protect the roofing system. However, if there is a hiccup in the process, such as the material not adhering correctly to the substrate, the risk of blow-off or billowing increase drastically, damaging the membrane itself. S&S Roofing is your Top Rated Local® trusted commercial roofing company. 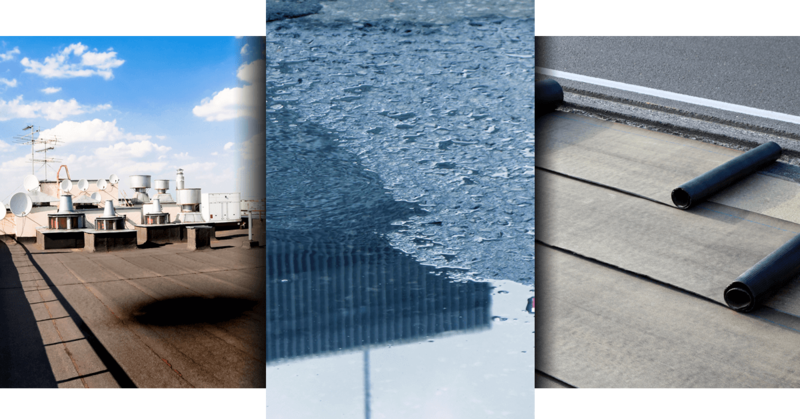 With over 30 years of commercial roof repair experience, we understand the necessary measures that need to be taken to protect your roof and your business. From repairs to maintenance and simple inspections, S&S has your best in mind and will work to help solve any issue that could cause larger problems down the road. Don’t let your roof be a victim of these common problems, call us today and have us come inspect your roofing system.